A couple of weeks ago I was celebrating at my bachelorette party, and it was so much fun. 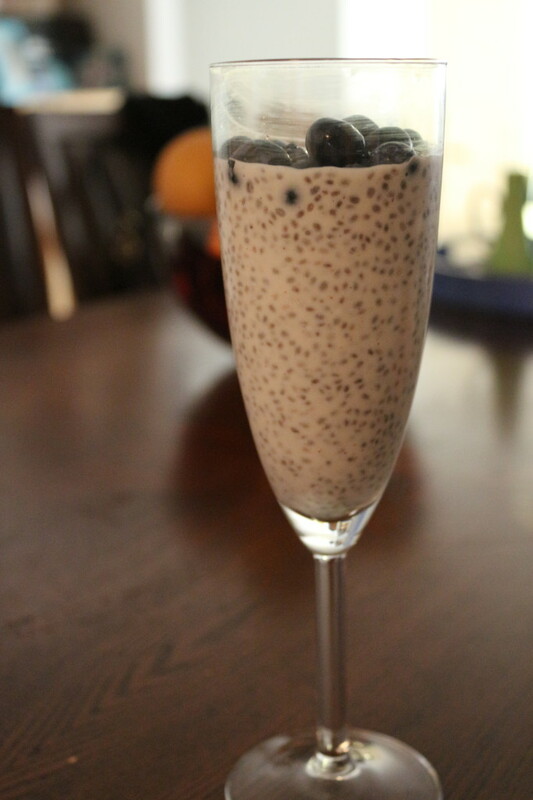 It was also a funny weekend because we had a lot of special eaters – no gluten, no dairy, no meat, no fish, no soy… The second night we had a private chef cook us dinner, and much to all of our delight, she made the most delicious vegan, soyless dessert – chia seed pudding! And, it was funny, because at lunch that day, the group was introduced to a similar dessert at Pain Quotidien. After my two tastes, I was hooked. So last week, I swung by Trader Joe’s and whipped up my own batch. It’s easy, healthy, and delicious. I should warn you – my pudding was a bit liquidy and not too firm, so in my recipe I suggest adding a bit more chia than I did. But don’t expect a Snack Pack, this is more of a creamy dessert — kind of like a vegan tapioca. 1. Stir together the chia seeds, almond milk, coconut milk, yogurt and cinnamon. Cover and refrigerate for at least four hours. 2. In the meantime, chop up your favorite fruit (and mix with sugar or honey if you want). Cover and allow to marinate for a few hours. 3. If you can, when the pudding is about 2 hours in, stir in the sugar and honey and allow to finish setting. Or, you can just add the honey/sugar when the pudding is done, or add to each serving per each individual’s taste. 4. After at least 4 hours have passed (or waiting overnight), spoon a bowlful of the delicious pudding mixture and top with a good helping of the chopped fruit. This entry was posted in Breakfast, Sides, Snacks, Sweets and tagged cinnamon, coconut, Gluten Free, Vegan, Vegetarian. Bookmark the permalink.